Kim Jaxon, director of the Northern California Writing Project, shares this post (originally written for the Connected Learning Alliance) about how her Writing Project site has experimented with using digital spaces to provide greater access to professional development for rural educators. The foundation of the NWP is “teachers-teaching-teachers,” a term used by the network to indicate the value they place on teacher practice. Historically, teachers who participate in the NWP start with a four to five week invitational Summer Institute where they present demonstrations of teaching practice, read current research in the field of writing studies, and write in personal and professional genres. After participating in the Summer Institute, teachers become teacher-consultants, “TCs,” in the NWP; many go on to lead in-service and continuity programs in their area schools. The NWP does not advocate for any particular theory of learning or model of teaching writing but has focused on teachers uncovering “best practices” for teaching; this work always includes elements of teacher research and reflective practice. Our local site, the Northern California Writing Project, (founded in 1977) was one of the sites selected by the national network to redesign a Summer Institute with an emphasis on new paths to participation. 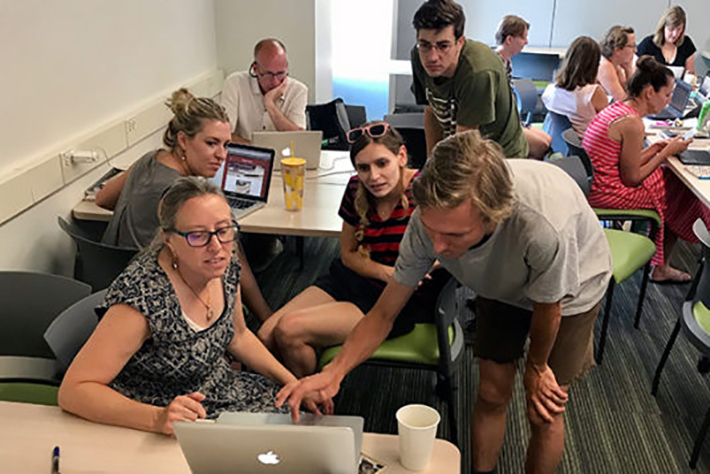 As part of the design, for the past two summers, the NCWP has offered a “hybrid” Summer Institute, using digital platforms as a way to maintain community and increase access to the community of educators. 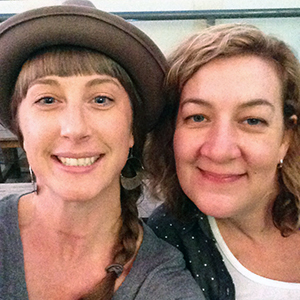 The redesign was led by Amanda Von Kleist and Lindsay Nemec, co-directors of the Summer Institute for the NCWP. Below is an interview with Amanda, who has taught special education in Hamilton City, CA for over 20 years and has been involved with the NCWP since 2004. She is a gifted educator who thinks deeply about her students and their access to education. It is no surprise that she brings this commitment to equity and access to her work with teachers as well. What lead to the changes in your Summer Institute? We had an opportunity to participate in some grant work through the National Writing Project called Building New Pathways to Leadership. This grant asked us to reflect on the barriers that impede access to participation and ultimately leadership in our Writing Project site. The Summer Institute is the foundational work of any writing project site. It introduces teachers to the beliefs and social practices that define the Writing Project. Teachers in the Summer Institute read academic texts, write about their teaching, talk and think together. Each teacher makes an inquiry presentation in which they examine and share a teaching practice around literacy. These presentations are interactive with teachers participating in the same activities as students would. Historically, our Summer Institute takes place over a period of three weeks on the Chico State campus. Because our site has a very large service area (approximately the size of Austria), some participants have to drive six hours or more. Our site provides housing as needed at local motels, but that can be expensive, and it is difficult for participants to be away from home for so long. We wanted to increase access by moving the bulk of our time to a digital space. What concerns did you have when you moved from face-to-face to virtual platforms? We had two major concerns as we moved to a virtual platform. We were not sure what the teacher presentations would look like. How would they be interactive? Would we be able to work and talk in small groups? Would the technology be too daunting? Our other major concern was that our interactions would be stilted and clunky. I had been to meetings on zoom and google hangouts in the past and the interactions were awkward to say the least. The thing about Summer Institute is that it is a social community. Teachers bond as they work hard together, share experiences, lament failures, celebrate successes and reveal the questions that drive their practice. This building of community is the magic of the Summer Institute. Losing that was our greatest concern. How did you maintain a community in the new structure? Describe a typical online day with teachers? We met on zoom each morning at 9:00 am until noon. Participants accessed the daily agenda in our shared google doc folder. Our agendas were living documents. At the top participants would find the zoom link for the day as well as links to any readings, websites, and collaborative documents we would be using that day. The first couple of days online, we did more of the kind of work we had been doing at our face to face camp. We read, wrote, responded and discussed pedagogy and literacy, but instead of being in the same room, we were in our homes, on our back patios, faces of curious children and family pets sometimes making cameo appearances while we did our work. On the third day our teacher inquiry presentations got rolling, two presentations each morning, again concluding at noon. Technically we were scheduled to go until 3:00 pm, but the afternoons were more loosely structured. Participants were accountable to their writing groups and book groups and decided for themselves if and when they would meet or if they just wanted time to read and write or respond on collaborative docs. In total, we met online for two weeks. In that time, we organically developed some social practices for interaction on the zoom platform. Everyone had the ability to share their screen, which allowed them to narrate in real time as they shared resources and moved through agendas. To eliminate feedback and background noises, everyone stayed on mute except the person speaking. When we were tasked with reading or writing for a given time, we would click stop video. As our faces re-appeared, in what I call Brady Bunch view, we would know when everyone was ready to come back together. We really got into a groove and zoom began to feel natural. The comfort and convenience of working from home (or from a hotel room in Reno and a high-rise balcony in Seattle as it turns out) was appreciated by all. Our running joke: business on top, pj pants on the bottom. What changes did you make for this summer? This summer, we made a few changes. We decided to use Google+ Communities instead of WordPress. Posting and commenting in G+ is a breeze. Each participant has their own page to curate all of their work, so it also serves as a digital portfolio. Our other big change is that we have included three “asynchronous” days. We posted readings, writing prompts and activities to our G+ Community and placed daily agendas in our shared google docs file. For those three days will not meet together on zoom. Participants do the work independently, but post and comment in a common digital space. We will come back together the following week for morning presentations on zoom in real time. This move to asynchronous work is definitely something that teachers want. Some of the applicants to the SI were under the impression that most of the work would be asynchronous. What advice would you give to other educators who want to structure PD using digital tools and platforms? I would advise any educators who are considering digital platforms for PD to go for it. Do a little research, a little experimentation. Think about ways to make the work collaborative and interactive. We found that breakout rooms were far better for discussions than whole group, and that Twitter and the chat feature in zoom let the conversation continue even when our mute buttons were activated. I think there is great potential for educators to network and collaborate in virtual spaces. For our Summer Institute, I am not ready to yet forgo getting started with a couple of days of face to face time to build trust and community, but I might just need think more about it.